VIZ Media Announces "Frankenstein: Junji Ito Story Collection"
VIZ Media Announces "Shiver: Junji Ito Selected Stories"
VIZ Media Offers New Edition of Junji Ito's "Fragments of Horror"
VIZ Media Offers New Edition of Junji Ito's "Gyo"
VIZ Media Acquires Junji Ito's "Fragments of Horror"
The Master of Manga Horror makes his first North-American appearance in Toronto, Canada, this May 11-12. TCAF, The Toronto Comic Arts Festival is proud to announce that acclaimed Japanese manga creator and international horror sensation JUNJI ITO will participate in TCAF as a Featured Guest and Official Poster Artist of the 2019 Festival, to be held May 11-12, 2019, in Toronto, Canada. Junji Ito is best known for his groundbreaking horror stories including Uzumaki, Gyo, Tomie, and “The Enigma of Amigara Fault,” and will travel to Toronto in support of his new short story collection Smashed: Junji Ito Story Collection, to be published this April by VIZ Media. Junji Ito will debut the new horror short story collection Smashed, the latest in an impressive line-up of great collections of his work in English. In the last 5 years horror fans have been treated to an incredible wealth of Ito’s material, including new hardcover deluxe editions of Uzumaki, Gyo, and Tomie, and all-new collections including Frankenstein, Shiver, and Fragments of Horror, among others, all available from VIZ Media. 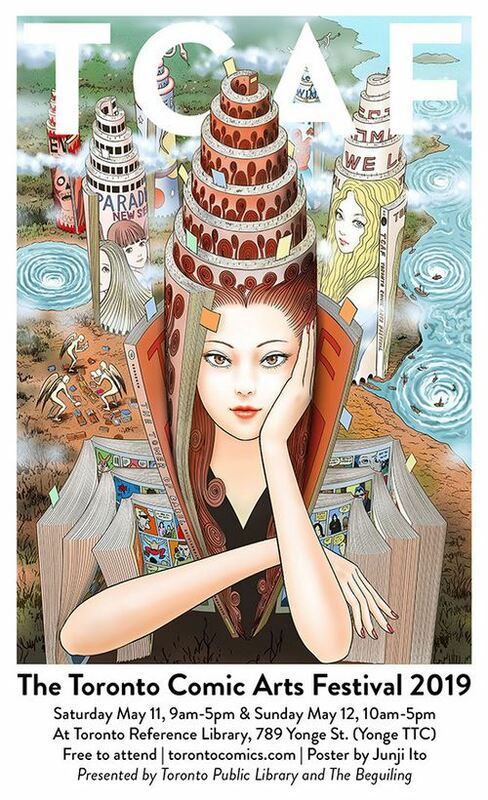 Junji Ito will join more than 350 exhibiting creators and publishers for The Toronto Comic Arts Festival 2019, with many more guests still to be announced! Visit TCAF online for up-to-the-minute updates! Junji Ito made his professional manga debut in 1987 and since then has gone on to be recognized as one of the greatest contemporary artists working in the horror genre. His titles include Tomie and Uzumaki, which have been adapted into live-action films; Gyo, which was adapted into an animated film; Fragments of Horror, adapted into an animated series; and the short story collections Shiver and Frankenstein, with all works having been published in English by VIZ Media. Other works of Ito's in English include Dissolving Classroom, published by Vertical Inc., and Junji Ito's Cat Diary: Mon & Yu, published by Kodansha Comics. Ito’s influences include classic horror manga artists Kazuo Umezu and Hideshi Hino, as well as authors Yasutaka Tsutsui and H.P. Lovecraft. Thirteen chilling nightmares, presented by the master of horror! Try not to be noticed when you eat the secret nectar, otherwise you’ll get smashed… What horrific events happened to create the earthbound—people tied to a certain place for the rest of their short lives? Then, a strange haunted house comes to town, but no one expects it to lead to a real hell… Welcome to Junji Ito’s world, a world with no escape from endless nightmares. Hardcover graphic novel coming April 16, 2019, from VIZ Media. TCAF would like to thank Festival sponsor VIZ Media, and Shogakukan Inc., for their support in arranging Junji Ito’s trip to Canada.